After a week and a half of rest and relaxation on Thailand's beaches, we were ready to pack away our swim trunks for a bit and put our sightseeing pants back on. Our first attempt was to visit a "typical" Thai town on our way south. Trang was typical, alright, with car part businesses greeting us as we disembarked our bus instead of tourist offices. Unfortunately we were more in the market for cooking classes than a new muffler and our search was not aided by the fact that unlike in the beach towns, the majority of locals did not speak English. 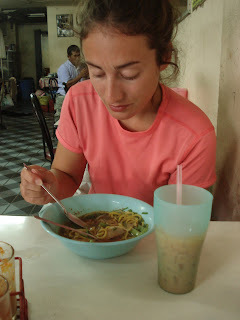 It didn't take long for us to figure out that there wasn't much for visitors to do in Trang--save for slurp a bowl of noodles and join in some Thai karaoke--and we were back on the road the next morning. A stop-happy bus, smelly van, expeditious border crossing, and another van (this time of the karaoke variety) later we were in Penang, Malaysia. The differences between Malaysia and Thailand were apparent shortly after clearing customs, certainly not night and day...maybe more like mid-morning and dusk. The four lane toll highway south, equipped with a Malaysian version of EZ pass, was a prime example of the country's modernity and the fresh, cookie cutter housing developments plopped in swampy marshland just off the road made it feel more like driving through southeast Orlando than southeast Asia. The other difference from Thailand that struck us upon arrival in Penang was the multiethnic makeup of the population, with Malays, Chinese, and Indians living and working in distinct enclaves that together created a unique urban tapestry. One of the great byproducts of this patchwork of cultures is the diverse cuisine available, in many cases in hybrid form. And better yet cheap dishes were never more than arms len gth thanks to Penang's abundance of delicious food stalls. The elevator in our hotel even had a guy selling noodles! Okay, that isn't true. Our favorite spot to chow down was Red Garden Food Paradise, an upscale, open-air food court down the street from our hotel where we could pick and choose from dozens of different vendors who would prepare and deliver the selections to our table. 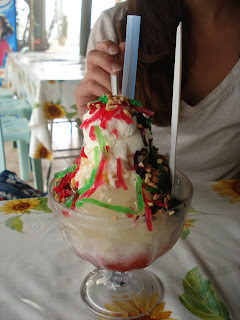 By far the weirdest thing we ate was the popular ABC Special available all over town: shaved ice topped with bubble gum flavored syrup, a scoop of ice cream, nuts, corn, beans, tapioca, jello pieces, and who knows what else. About as delicious as it sounds, which is not delicious at all. Penang's multiculturalism is further reflected in its unique and beautiful buildings. It was not uncommon to come across a mosque, Hindu temple, Buddhist temple and church within Adhan distance of each other. Must make for interesting block parties where alot of those "bar" jokes are told--you know, "An imam, a priest, and a monk walk into a bar..." The worn streets of Colonial Penang, the historic heart of town, are great for wandering, and Khoo Kongsi is the highlight. This Chinese clan house celebrates the lineage of hundreds years of Khoos in Penang's Hokkien Chinese community and to this day members' academic degrees are ceremoniously displayed in its halls. The lavish details in reds and golds were stunning. Over in Chinatown, its a vibrant indigo that attracts visitors to another Chinese landmark, the Cheong Fatt Tze Mansion. At night the mansion looks like something out of Cinderella and by day it is open for guided tours. Our energetic host related the original owner's rags to riches story and told us more than once that he was known as the "Rockefeller of the East". Even more interesting to us was the crash course in Feng Shui with the 38 room mansion as text book. We are fully prepared to set up our next home in Boston with good ch'i. On the outskirts of town, Penang Hill is a celebrated retreat from the heat and bustle of the city. We took a crowded funicular to the top and were excite d to see the much lauded views, but instead found ourselves stuck in the clouds. As advertised, though, it was a few degrees cooler. A short taxi ride away is the sprawling kaleidescope of Kek Lok Si, the largest Buddhist complex in southeast Asia. The Laughing Buddhas were joined by congenial animal statues, and with more gift shops than places for prayer it felt like how Disney might do temple. That being said, the colorful palette and impressive seven-story Pagoda of 10,000 Buddhas certainly made it a sight worth seeing in our sightseeing comeback. 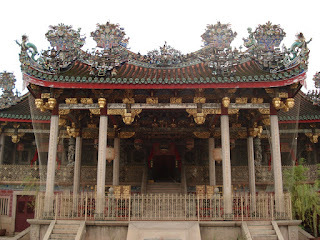 View more pictures from Penang here. the cuisine-really delicious to look at and i bet it taste good also..
@louisebah We loved the cendol too! It might have been the corn smell mixed with the bubble gum syrup taste that put us over the top for the ABC.